Submitted by Bill Schmoker on 8 December 2010. This entry is dedicated to the Marine Mammal Observers (MMOs) from our cruise: Justin, Sarah, & Kwasi! I'm currently on another PolarTREC journey, this time to California in anticipation of a core sample workshop at the United States Geological Survey offices in Menlo Park, California. We took several deep-sea core samples while in the Arctic Ocean, which were promptly trimmed into manageable lengths, sealed, labeled, recorded, and then put into a walk-in refrigerator. When the Healy returned to its home port in Seattle this past October, chief scientist Brian Edwards drove up to retrieve the cores and ship them in a refrigerated truck to Menlo Park, where they have been awaiting the detailed analysis that happens in labs equipped with the right gear. I am thrilled to be involved with the shore-side aspects of the expedition, eagerly waiting to learn about core analysis and to hopefully get some hands-on experience and the chance to again contribute to the team. I'd like to thank Brian Edwards and Helen Gibbons of the USGS for the invitation and PolarTREC for sending me to the West Coast. We were originally going to begin the workshop on Monday but the schedule got bumped back a few days. I already had my plane ticket and so decided to do some independent oceanography study by visiting Monterey Bay and the Monterey Bay Aquarium before setting up shop in Menlo Park. Monterey Bay is amazing on many levels, but the most significant physical feature there is the Monterey Submarine Canyon, which puts deep water very close to shore and funnels nutrient-rich cold bottom water up to the surface in a process vital to sea life called upwelling. The base of the food chain, tiny photosynthesizing organisms collectively called phytoplankton, thrives on the mix of nutrients brought up from the deep and sunlight from above. Tiny animals collectively known as zooplankton thrive in turn on the phytoplankton. The mix of plankton feeds small fish and invertebrates, creating a forage base for swarms of birds, larger fish & invertebrates, and a wonderful diversity of marine mammals. As the name implies, marine mammals depend on oceanic habitats for their livelihoods. As mammals they still breath air, have fur, are warm-blooded, and nurse their young. Marine mammals are classified into three orders. One, the Sirena (sea cows), is not found in Monterey Bay or anywhere in the Northeast Pacific (sadly, Steller's Sea Cow was hunted to extinction in the North Pacific by 1768.) The other two, Carnivora and Cetacea, are amply represented in Monterey Bay. Order Carnivora is interesting because some members are land mammals. Otters, polar bears, seals, sea lions, and walruses are the marine mammal representatives of that order. The order Cetacea is split into two suborders; Mysticeti (baleen whales) and Odontoceti (toothed whales, dolphins, & porpoises.) 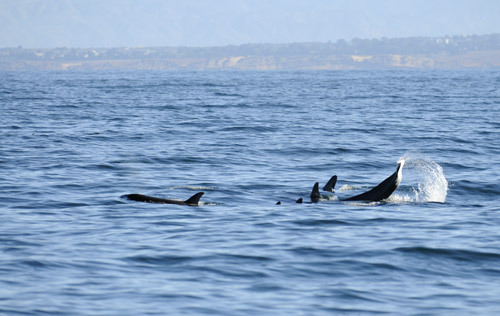 Amazingly, I was able to experience several examples of these on one 4-hour whale watching cruise out of Monterey Harbor. Among the mix was the smallest and the largest marine mammals- can you guess which ones these are? Below are some pics I took on the cruise or nearby rocky shoreline, and a few interesting facts about each species that I cobbled together from our whale watch cruise naturalist, at the Monterey Bay Aquarium, and by reading The Monterey Bay Whale Watcher's Guide to Marine Mammals of the Eastern North Pacific. Our smallest Marine Mammal! 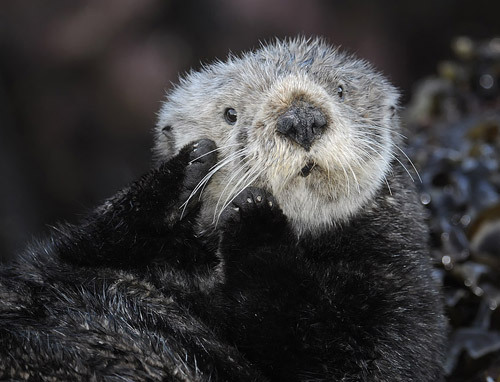 Lacking blubber, sea otters instead have the most dense fur coat of any mammal, with over 1 million hairs per square inch. Sea otters also have a highly stoked metabolism to keep warm and eat up to 1/4 of their body weight daily to get enough calories. 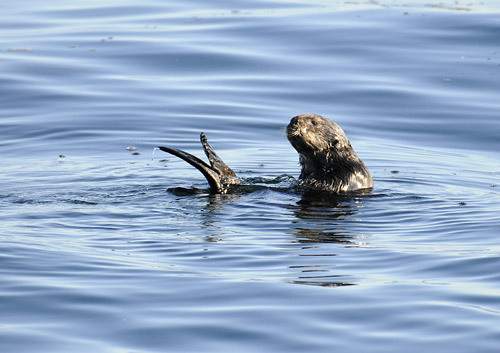 Sea Otters belong to the tool-use club, sometimes breaking open hard-shelled food items with rocks or large shells. This sea otter was taking a break from the waves, meticulously grooming its fur in a protected rocky grotto at low tide. This sea otter is in the classic feeding position, floating on its back and holding its prey on its chest. If the prey's shell is too tough, the otter will bring up a tool such as a rock to pound it open in this position. 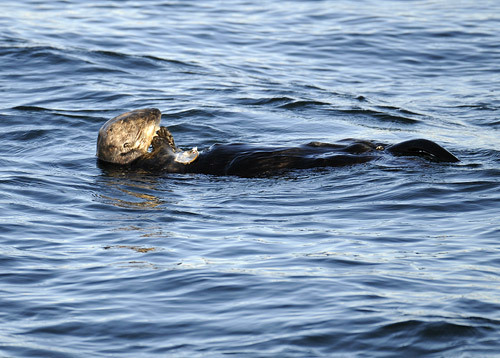 After it finished a shellfish, this sea otter straightened up to look around the Monterey Harbor before diving for more food. Perhaps it was looking for its companion as there was another otter feeding nearby. Usually found near shore, often in protected waters such as the harbors that give it its name. Harbor seals range from pale gray to nearly black. Note in the pictures the lack of external ears on seals. Also, they can't walk on their flippers they way Seal Lions do, instead flopping their way onto rocky haul-outs when they want to bask in the sunlight and take a break from the cold water. 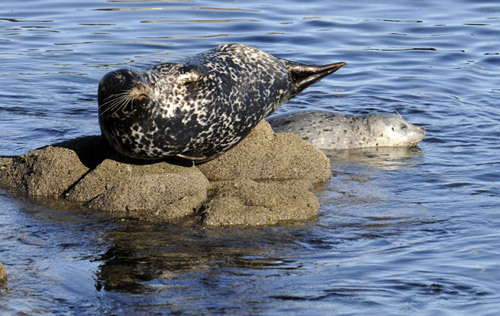 Two harbor seals, one lighter and one darker, enjoy the sun and rocks in Monterey Harbor. Sea lions are named for the furry ruff that mature males develop. In comparison to the harbor seal, note the small external ears that give their faces a more dog-like look. They can also get up on their front and back flippers to walk (after a fashion) instead of undulating on their bellies along like a seal. 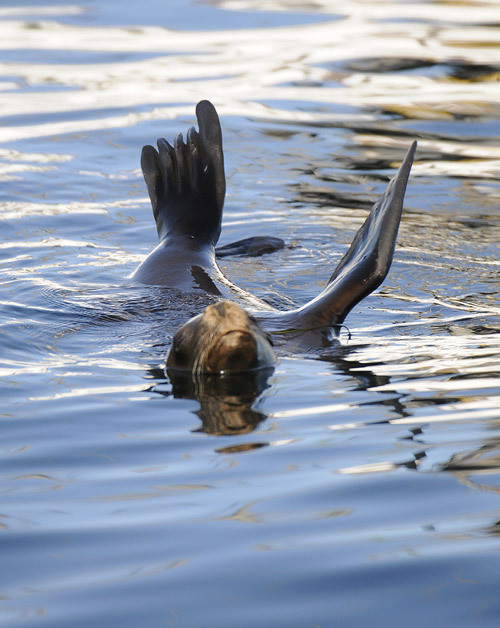 When Sea Lions can't haul out onto a rock, pier, or buoy, they bask by holding one front flipper and their rear flippers out of the water to catch the sun. A popular rock at Pt. 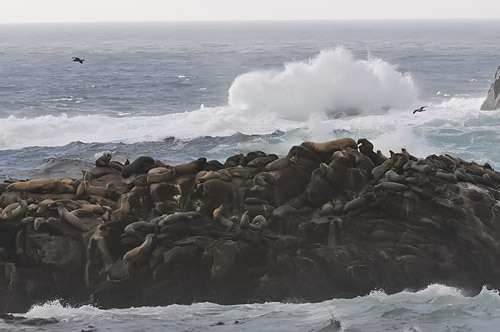 Lobos, just south of Monterey Bay, provides a haul out for Sea Lions that is protected from the surf and shore. 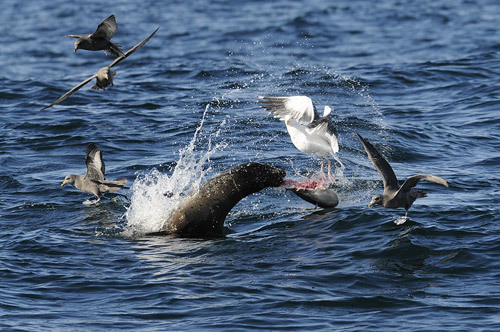 This sea lion has caught a small mola mola. Mola molas have very tough skin so the sea lion thrashes the fish to tear out bites. Seabirds such as northern fulmars (gray) and western gulls (white) actively join the fray hoping for scraps. These were that smallest whales we saw, with adults just under 4 meters long. They have a blunt head which is filled with fluid that amplifies their sonar signals. Muscles surrounding the fluid reservoir can change its shape to focus the sound pulses- pretty amazing! This species gets pretty gouged up with scars over its gray-colored skin. 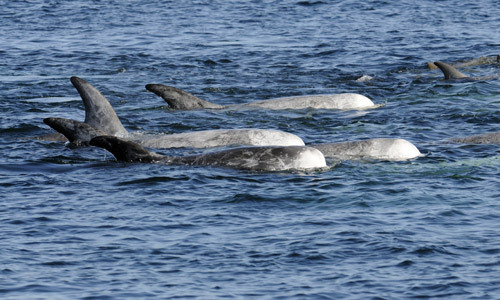 The parallel grooves are from other Risso's Dolphins, while the more random scars are souvenirs of battles with large squid. This species even hunts giant squid on occasion, a species much larger than an individual Risso's. Perhaps they hunt large prey like Giant Squid cooperatively. 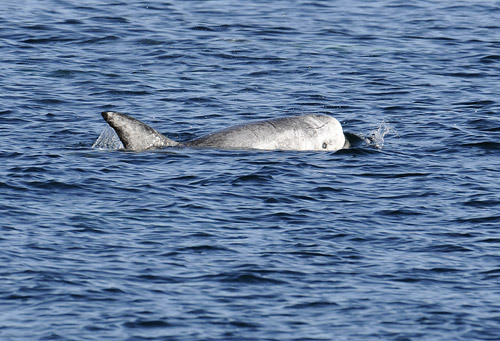 A Risso's dolphin surfaces in front of the boat. Note the blunt head, falcate dorsal fin, and scarred gray skin. The parallel gouges are from fellow Risso's dolphins while the more random scrapes are from large squid fighting back. A nice pod of Risso's Dolphins near the entrance to Monterey Harbor. Risso's dolphin illustration courtesy of The Cetacean Society. We were exceedingly lucky to experience a pod of 10 Killer Whales (also known as Orcas) on our whale watching cruise. This was a transient pod, one of two types of orcas that live near shore. Transient orcas specialize in hunting large prey such as seals, sea lions, and small whales. They even attack young gray whales. The other type of orca found near shore are known as residents, and they prey on fish. 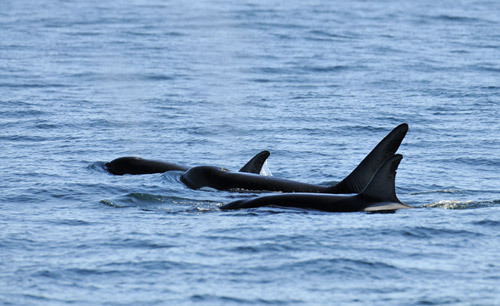 The saddle (gray area behind the dorsal fin) on transient orcas connects over their back while resident orcas' saddles have black down the back, separating the gray areas on each side. Males have triangular dorsal fins nearly six feet tall. The dorsal fin on females has a curve to it resembling a falcon wing so it is described as falcate. 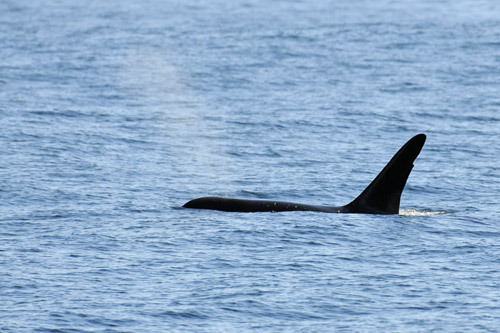 This male orca can be told by its long triangular dorsal fin. Note the whale's blow, which angles forward when it surfaces. A shorter, curving (falcate) dorsal fin tells us this orca is female. Each individual has a unique pattern of scars, fin notches, and patterns in their gray saddle that allow researchers to track individuals. 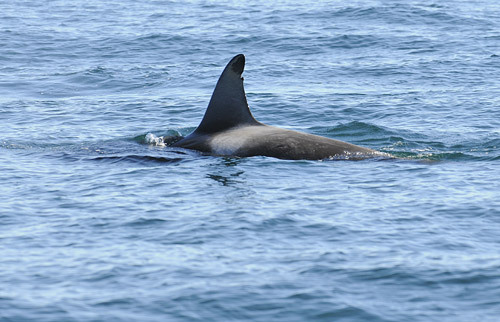 The fact that the gray saddle connects over the back also identifies this as a transient orca. About half of the pod of 10 orcas seen on our whale watch. The back individual is slapping the water with its tail. I wonder if the tail-slapping has a meaning or if it is just having fun? Here we have a male orca with two females. Can you tell them apart by their dorsal fins? 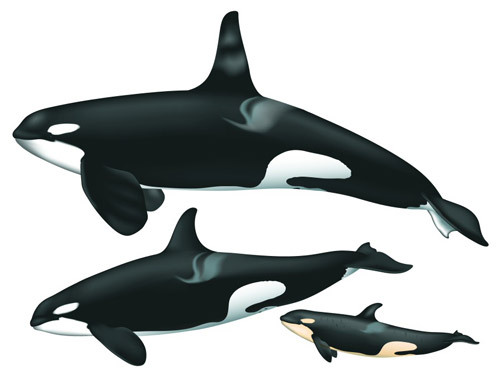 Orca illustration showing male (top) & female (below) with youngster. Courtesy of The Cetacean Society. Our largest marine mammal. Not only that, but blue whales are the largest animals to ever live on Earth! The largest blue whale measured was nearly 110 feet long and weighed about 200 tons. Sadly, this magnificent species is endangered due to commercial whale hunting prior to protection enacted in 1966. While blue whales are truly giant, they prey nearly exclusively on krill, tiny crustaceans which only grow to a few centimeters in length. 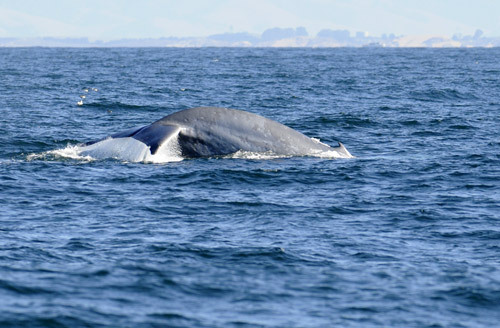 The past summer brought an explosion of krill to Monterey Bay and soon 60 or more Blue Whales were counted exploiting this resource. They hadn't been seen for weeks, though, presumably having moved on, so we were astoundingly lucky to come across a pair still in the bay. 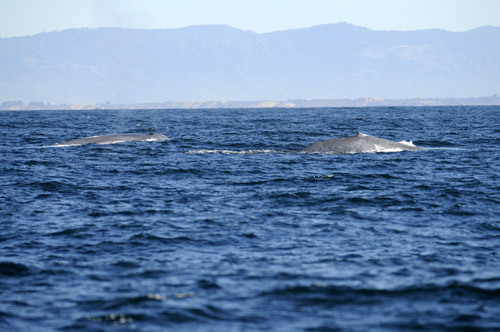 Two blue whales in Monterey Bay. Only about 1/4 of their bodies are visible at any time at the waterline. Note the tiny curved dorsal fin on the front whale- this is towards the back of the whale's body. After 4 or 5 breaths interspersed by shallow submersions, the blue whale arches more and brings its tail up to dive deeper in search of krill. The tail is about 20 feet wide! Blue whale illustration with diver for size reference. Note the small dorsal fin towards the back. Courtesy of The Cetacean Society.